This is a collaboration between Manchester Museum, part of The University of Manchester and the Partition Museum (set up by The Arts and Cultural Heritage Trust), Amritsar, India. 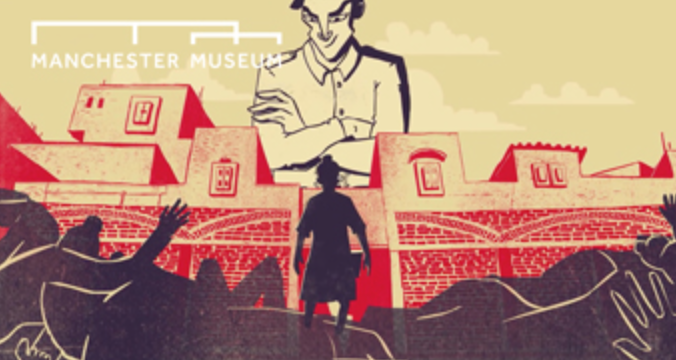 The co-curated exhibition ‘Jallianwala Bagh 1919: Punjab under Siege’ coincides with the centenary of the Jallianwala Bagh massacre in April 2019, and the bicentenary commemorations for the Peterloo massacre. Revisiting the event, its causes and aftermath, the nuanced exhibition explores what we remember, how we remember it, and what we have forgotten, in India and the UK. Jallianwala Bagh 1919: Punjab under Siege explores the causes for the unrest in the Punjab before, during and after the events which took place on 13 April 1919, when British troops opened fire on peaceful Indian protestors. Protestors had gathered to challenge British rule before they were set upon by Colonel Reginald Dyer and his troops. Confined within an enclosed barren ground called Jallianwala Bagh in the Indian city of Amritsar, hundreds of Indians were killed and thousands injured. This was a defining moment in the fight for Indian independence and led to the eventual demise of the British Empire in South Asia. The exhibition will raise awareness of the peaceful protest and direct action, martial law, the divergent British and Indian inquiry findings, and the ongoing social, political, and cultural response. The need for such alternative perspectives is also inspiring the creation of the South Asia Gallery at Manchester Museum, part of a £13.5 million transformation hello future, which is due to open in 2021. The gallery is a landmark partnership with the British Museum and co-curated with members of Manchester’s South Asian diaspora communities. the Whitworth. Manchester Museum will also open capsule exhibitions at Birmingham Library and the Nehru Centre in London in early April to highlight the centenary nationally. Internationally renowned, contemporary, artists, The Singh Twins, whose award winning work explores important issues of social political and cultural debate will feature new artwork commemorating the 100th anniversary of the Jallianwalla Bagh massacre. The artwork comprises of three panels; the left provides historical context highlighting the oppression of India under the British Empire and Raj, the center focuses on the massacre itself and how it divided opinion in India and Britain. The right panel explores the impact and legacies of Jallianwala, referencing India’s freedom struggle. ‘Jallianwala Bagh 1919: Punjab under Siege’ opens on 11 April 2019 and closes on 2 October 2019 a date which marks 150 years since the birth of Mahatma Gandhi. The exhibition will be formally opened by Lord Desai on behalf of the Partition Museum, Amritsar India. Lord Desai is a member of the Jallianwala Bagh Centenary Commemoration Committee, set up to mark 100 years since the tragic event. He has actively campaigned to commemorate the 100th anniversary of the Jallianwala Bagh massacre, initiating a debate in UK Parliament to discuss the British government’s plans to commemorate the centenary. Lived experience will be at the heart of the exhibition and the museum will work with descendants and communities to collect stories related to the Jallianwala Bagh massacre.